I hope everyone is recovering well from the holiday weekend. I had my whole family in town and it was such a great time. It is not often that all four of us Adams kids get to be all together so I cherish every moment of it. I always wish the time was longer but I will just get to look forward to the next family outing. Now onto what is pictured above and the reason you are here. I can’t say enough about these new Levi 501 jean cutoffs, my favorite detailing is the button fly. I had a similar pair from last year (here) but these just have a bit more flare but downfall they are $10 more. Can’t lie, even with the extra money they are a better pair for your closet, you will really like them. Ok, so this top is from three years ago and I have been looking for a similar one since. I FINALLY found one and it is so similar and under $80 (a much better deal then the one I am wearing which is kate spade and was $198). Cute shorts and love the eyelet top! 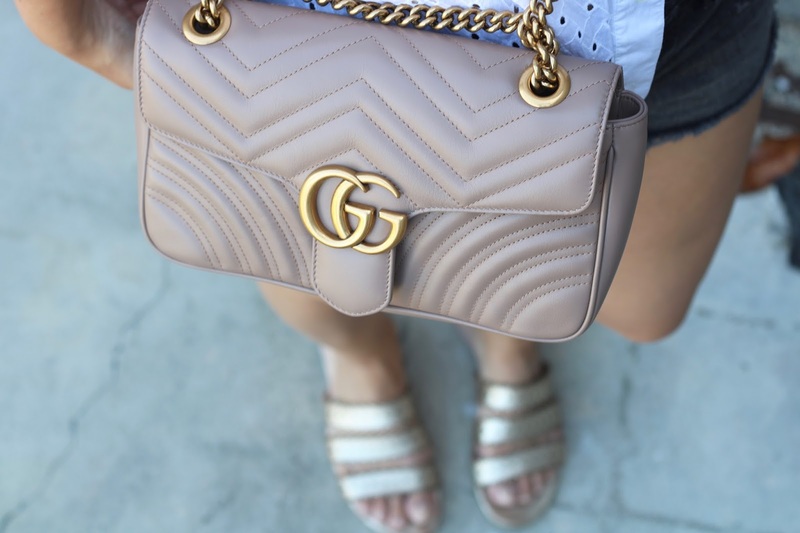 I love the Gucci bag – major wish list item! So glad you had a good time with your family. Love this cool summer style on you! The top is so cute and it's so beautifully paired with the sandals and blush colour bag! Love this outfit!! So cool and it really suits you! So cute, love that top and obviously that bag is just WOW! Cute top & love that shade of denim! I love the simple but subtly sophisticated look. This look exemplifies why eyelet is a must for summer! Nice outfit! Love the top and obviously love that bag 🙂 ! What a beautiful yet simple look. That eyelet top is gorgeous on you, and I also love the denim cutoffs!